We know that the Ford Mustang Hybrid is coming, but we don’t know very much about it — apart from what it might wind up looking like, compliments of the “Future is Built” commercial (skip to the 34 second mark). 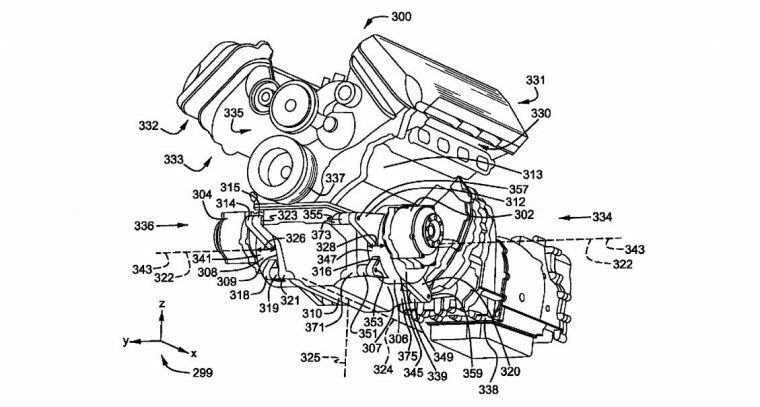 Per a new patent published this month, we now may have some insight into its powertrain. Watch: “Built Ford Proud” — Is That You, Ford Mustang Hybrid? The patent, first discovered by AutoGuide, outlines a “twin motor drive system for hybrid vehicle” that would leverage a combustion engine to power a vehicle’s rear wheels and twin electric motors to drive the front wheels. The figure presented in the patent is a V8, though the engine size is not specifically mentioned in the filing. Conveniently, if you pause the above commercial just before the futuristic Mustang grille is brought into focus, you see under the hood at what may very well be a similar setup to that outlined in the document, V8 and all. Hmmmmmm. It’s been two years since Ford originally confirmed the Mustang Hybrid (and F-150 Hybrid) as part of its growing investment in electrified vehicles. Since then, Ford has been totally mum on its electrified pony, and speculation has suggested that it would ultimately utilize the Mustang EcoBoost’s 2.3-liter turbo and boost it to 400 horsepower with the electric motors. If the V8 is the engine of choice, the Mustang Hybrid ought to be quite a bit more powerful, but it would also probably be significantly less efficient than one would expect a hybrid to be. In any case, the Mustang Hybrid is expected to bow by 2020, so it might just be a matter of time before the real details get spilled. Perhaps Ford has something special in the works to celebrate the Mustang’s 55th anniversary this April? More Ford Speculation: Will there be a Fusion Sport Wagon after the sedan has gone the way of the dodo?